Bills need to get paid on time. Staff will want to get paid. Customer complaints need to be addressed. Marketing efforts need to be tended to. These daily chores can take up a big part of your day. The secret to staying on balance is to set aside time throughout the day/week to handle these tasks individually. Stick to a schedule, as that will become a foundation you can use to budget your time wisely and effectively. Lift systems will break down. Trucks will get lost on their way to a delivery. Weather can sideline a shipping schedule. As they say, things happen when you least expect them to. A wise planner will foresee the bumps that can appear in the road long before they come over the horizon. Having alternate routes planned and maintenance teams at the ready while paying close attention to the weather reports can help you smooth out the wrinkles that can ruin a day. Planning for the road ahead is something that mobile storage operators need to do every day. Good ideas can come from team members, competitors, and clients. Keeping your eyes and ears open can help you find ways to improve your business and position it for changes within the industry. It is something that should be done every day. If you are not constantly looking for ways to streamline your operations and improve the quality of your services, then you are falling behind the competition. Drivers show up late. Security cameras go down. The pipes in the warehouse spring a leak. 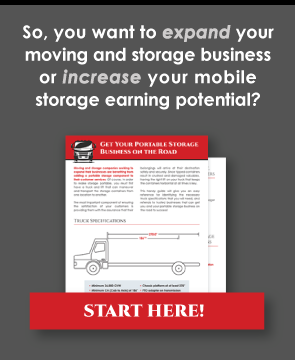 Problems come up as frequently in the mobile storage business as they do in any other business. If you deal with them quickly, then they won’t ruin your day or sap your profit margin. One of the most important tasks you will do every day is to head off minor problems before they become major issues. It is a solid strategy to build contacts that can help promote your business. The more people you have funneling prospective clients your way, the greater your opportunities will become. Every day is an opportunity to reach out to real estate agents, sports teams, school districts, remodeling companies, etc. who might have a need for your services. Taking the time to build these personal connections is a daily task that is well worth investing time towards. It’s is not a good idea to get in the habit of filling in for your team members when they call in sick or take a vacation. While things do come up, you will want to keep these disruptions to your schedule to an absolute minimum. After all, your job is to run the business. Developing protocols and procedures for employee illnesses and vacation time can help you keep your day on track. Life as a mobile storage operator is no different than life as the operator of any other business. It is a life of routine that can be liberating and rewarding. It requires hard work and dedication, but more importantly, it requires a mindset that sees issues and addresses them before they become problems. With time and experience, the daily routine can become quite comfortable and enjoyable.